Rent villas and apartments in Carcassonne Arrondissement, the South of France with private pools. This cosy four bedroom holiday home is situated in the charming village of Minervois. It has been thoughtfully furnished and includes a comfortable living area, well-equipped kitchen. This 4 bedroom house with private pool is located in Alzonne and sleeps 8 people. It has WiFi, a garden and barbeque facilities. This 2 bedroom house with private pool is located in Montréal and sleeps 6 people. It has a garden, barbeque facilities and parking nearby. This spacious terrace property is wonderfully equipped for a relaxing holiday. It is nestled within an attractive holiday complex, with three other properties. 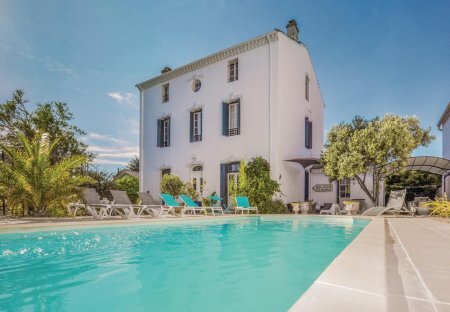 A sensitively restored Languedoc farmhouse for 4. Glorious Pyrenees views. Large shared swimming pool. 7 acres. This cosy, terraced holiday home is charmingly furnished with stone walls, beamed ceilings and wooden floors, as well as comfortable furnishings. This 2 bedroom apartment is located in Azille and sleeps 6 people. This 1 bedroom apartment is located in Azille and sleeps 4 people. This 3 bedroom apartment is located in Azille and sleeps 8 people. This 1 bedroom apartment is located in Azille and sleeps 5 people. This 2 bedroom apartment is located in Azille and sleeps 5 people. This 1 bedroom apartment with swimming pool is located in Azille and sleeps 2 people. It has WiFi. This 1 bedroom apartment with swimming pool is located in Azille and sleeps 4 people. It has WiFi. This 2 bedroom apartment with swimming pool is located in Azille and sleeps 8 people. It has WiFi, barbeque facilities and parking nearby. This 2 bedroom apartment with swimming pool is located in Azille and sleeps 5 people. It has WiFi, barbeque facilities and parking nearby. This 1 bedroom apartment with swimming pool is located in Azille and sleeps 4 people. It has WiFi, barbeque facilities and parking nearby.